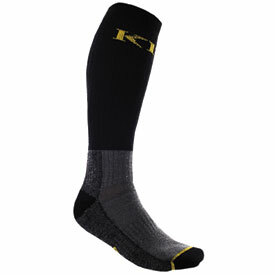 The Mammoth Socks are some of Klim's warmest and thickest technical socks ever created. The Klim Mammoth Socks were designed to enhance the performance of Gore-Tex boots by wicking moisture away from the skin allowing the foot to stay warm and dry even in the harshest environments. 100% Terry construction for added warmth and padded comfort. 43% Merino Wool / 40% Acrylic / 13% Lycra / 4% Polyamide. High thermal retention value to help hold heat in. Above calf design for warmth and comfort. Ankle and arch support stretch bands to help keep sock in position, no slipping or bunching. Patterned bend and regular knit at front mid ankle to help prevent bunching. Nylon reinforced toe, heel and sole for ultimate durability. Note: The use of a technical sock is required to obtain the full functionality of Gore-Tex boots. I live in the Arizona desert but bought these for an Adventure trip to Death Valley during the February 2019 winter storm where we'd be seeing rides in the low 30F's. We were even caught in rain and snow while I wore these socks. The socks performed flawlessly and kept my feet warm even when we weren't working. I had a 30 mile highway run in low 30F temperature in adventure boots and my feet were always warm. I think they are made for much colder temps, but they were comfortable. They're too warm if the day will see 60F or higher, but that's not what I bought them for. They paid for themselves with just this one trip. These socks do a good job of keeping my feet warm in the winter. They are a little expensive, but Santa brought them so that's OK.
Klim stuff just lasts a long time and this sock seems like it will as well. It is warm, dries fast and is comfortable. Price was reasonable and as long as it lasts (like all my other Klim stuff) then I'll be happy forever. I love these socks second pair and my wife always tries to steal them. They are thicker than normal socks but not a thick as some cold weather wool socks. work great in my Klim boots! Sizing; I only see 4-6 and 11-14. Is there a size offered inbetween these two sizes? BEST ANSWER: We have these in small (4-6), medium (7-10) and large (11-13) sizes.